IRELAND’S MOST ENIGMATIC political grouping goes by many names. Officially, they’re the ‘Reform Alliance’. Sometimes (somewhat unfortunately) they’re referred to as ‘the Ra’. And occasionally — no doubt much to the dismay of the group’s less high-profile members — they’re called ‘Lucinda Creighton’s Reform Alliance’. Whatever they are, the group of expelled and former Fine Gael politicians always insist they’re not a party. Whether they liked it or not, there were more questions on just that subject for the TDs and Senators who make up the grouping earlier — as it had been speculated that today’s publication of a set of political reform proposals could be a prelude to them at last becoming a party, in a more traditional sense. “I had to make a really tough call on that,” Senator Fidelma Healy-Eames said, on the question of whether she ever saw herself ever re-joining Fine Gael. The Galway politician said that though she had been “totally torn” on whether to renew her membership, she eventually decided to let it lapse. Next to her, Wicklow TD Billy Timmins seemed more open to the idea, noting “a day is a long time in politics” and indicating that he remained open to offers. “The line of questions coming from the floor just shows how wedded we are to the traditional concept of politics in Ireland be it party political, be it whip system,” he opined. It doesn’t always have to be like that. 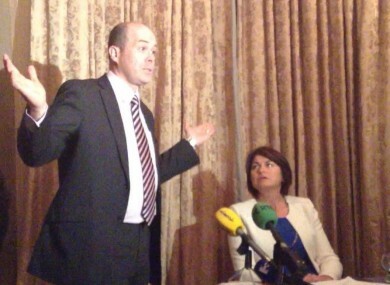 Denis Naughten, who hosted the press event alongside his two colleagues, just didn’t want to get into it — saying he’d made his position clear “all along… Not just today, not last week, not last month, not last year”. The three politicians were also asked why their leading light, Lucinda, was lurking at the back of the meeting room, rather than up front holding forth on the group’s new reform plans. “We didn’t see the point of us all piling up here,” Healy-Eames said. Well. It was a small room. *He wants to run as an independent in the next election. Email “Do the RA want back in Fine Gael? : 'No' ... 'I don't know' ... 'Google it' ”. Feedback on “Do the RA want back in Fine Gael? : 'No' ... 'I don't know' ... 'Google it' ”.